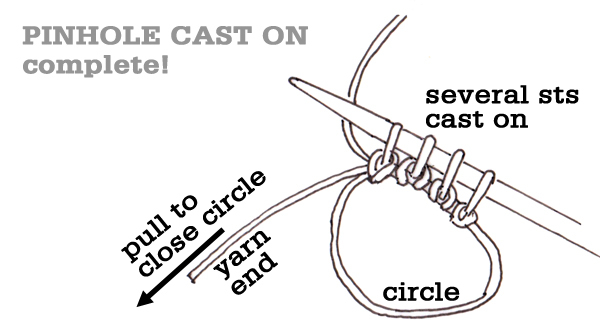 The pinhole cast-on is an elegant way to start a piece of knitting from the centre. It is used to begin circular and square shawls, blankets, top-down hats, and other similar items. The POP!! blanket and the Dogwood Blanket both use the pinhole cast on. While you may find it quite awkward the first, second, and perhaps third time you try it, it becomes easy with practice, and is a useful technique to add to your knitting repertoire. 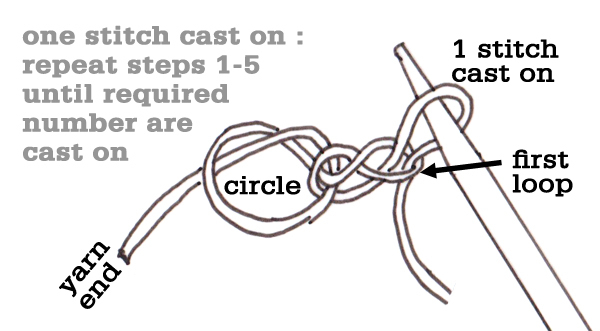 Note: I have described and illustrated these instructions using a knitting needle, because that is how I do it, however you may find it easier to use a crochet hook instead, and then transfer the cast-on stitches onto knitting needles at the end. The instructions are the same in either case, so you can try both and see which way suits you best. 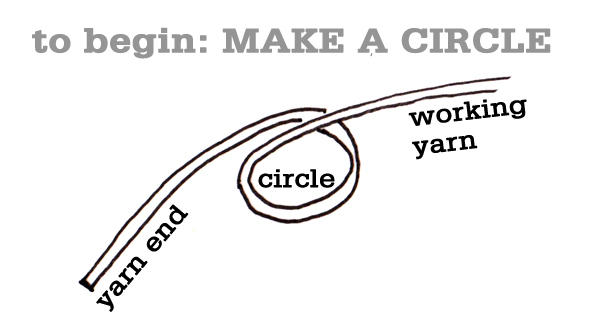 To begin, create a circle using the end of the yarn. 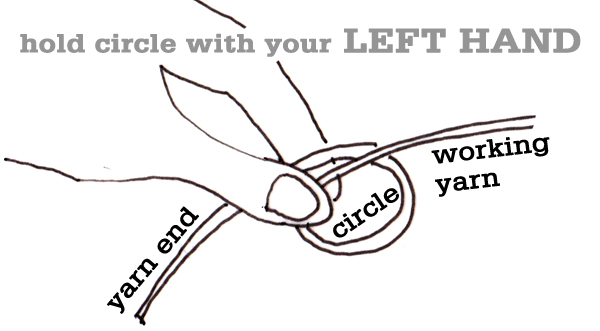 Pinch the circle in your LH, and hold the needle and working yarn in your RH. 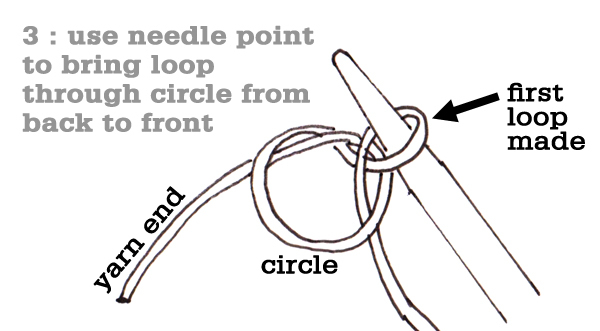 You will create new stitches using the point of the needle, working into the centre of the circle. Repeat steps 1-5 until you have cast on the desired number of stitches. Pull on the yarn end to close the circle up to a tiny spot in the centre of the work. Easy Peasy Lemon Squeezy! It must be noted that this technique is also referred to as the Emily Ocker cast-on. So many fabulous Emilys in the knitting world eh? Is that too cheeky or what?! What have you been struggling with? Are there any techniques that you would love to learn? Is there something you think that we should cover on the blog? We love to hear from our readers, so be sure to pop us an email! I am working on the POP blanket and it is so beautiful but my cast off remains super tight. Any suggestions? Try the stretchy bind off recommended in the pattern and try going up a few needle sizes for the bind off. Just got the Vivid blanket pattern and used this tutorial to learn how to do the pinhole cast-on. Thank you so much! The great drawings make it so easy to follow! It took me 3 tries (and one change of yarn) to get it just right, and I have finished my first test square. Can’t wait to try another one!!! I just bought the POP! pattern. Printed it out, got out my GORGEOUS Noro yarn, and needles. I looked at the pattern for the first time and my heart sunk when I saw that I had to learn a new cast on. ola casey onde comprar a receita da colcha? 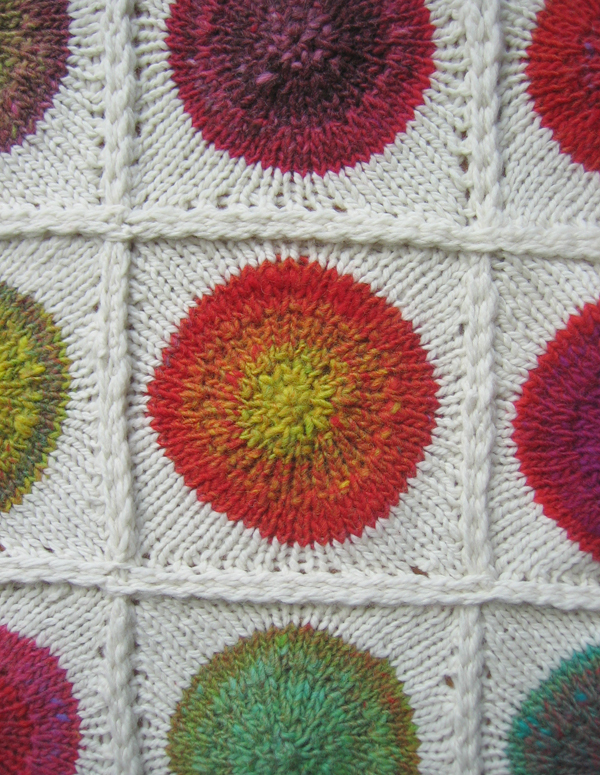 I’d like to enlarge one circle of the pop blanket to make a circular cushion cover. Can you advise me how to go about increasing the circle to make it much larger than in the pop blanket please? Thank you very much; this is he first time I have understood this cast on because your pictures are so clear. Keep coming back to this page to refresh my memory! 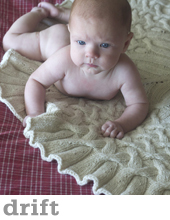 Knit the Vivid blanket and loved the pattern and the results. Thanks for your creativity and clarity!! 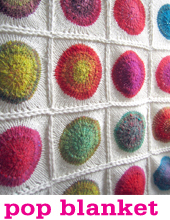 Marie – I am about to attempt the Vivid blanket and am apprehensive. What does it mean by wet block the squares ?? Amazing hand-drawn tutorial! I’ve never had such an easy time learning a new knitting technique – thank you! I have been enjoying knitting up the POP Blanket for my little one, but I do have an observation to make regarding your Pinhole Cast On Tutorial. I looked at your images again and again and keep on coming up with the same result: my stitches end up twisted after the cast on (I am casting on using knitting needles). This leads me to think that one of your images might be faulty. I think it is due to the image in step 4, where the yarn wraps from front to back instead of back to front as in step 2. 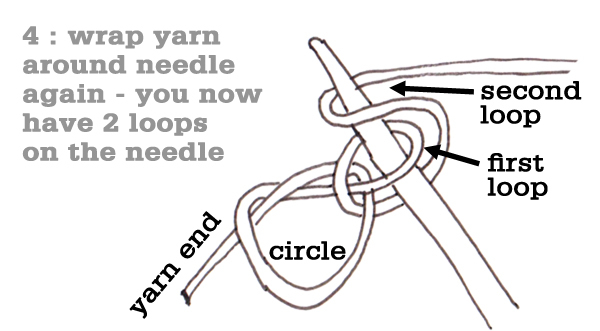 It seems logical that this can’t be, as with a crochet hook one would always grab the yarn the same way? Or am I missing something obvious? I did try to wrap the yarn from back to front for step 4, but this gets really tricky with a knitting needle. In the end I just opted for readjusting my loops when knitting them up. First off I just want to say I love this!!! Hi Debbie – thanks for your question! When I get to the end of one of the needles in magic loop, and the lace pattern has a yarn-over at the end of the needle, what I do is work the yarn over as usual (wrap the yarn from the back, to the front, then over the needle to the back of the work). Then I use my left hand to pinch that yarn over on the needle, while I rotate the work 180 degrees, so that the needle I just worked onto is in the back… keeping my left hand pinched over the yarn over prevents it from falling off the needle. Then I push the old LH needle back into the new 1/2 of the stitches, and pull out the old LH needle, drawing the tip under the working yarn. Then I work the first stitch right away, thus ‘trapping’ the yarn-over, so it’s in place and can’t go anywhere. Not sure if this description is clear… but best to try it when you’re not too tired! Good Luck! Solid question, I used dpns to start, then switched to a circular for the border. Emily used magic loop for the whole thing. 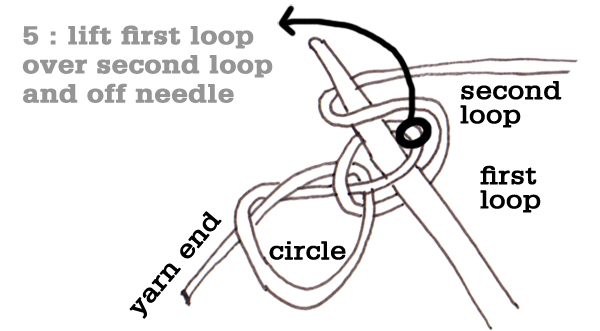 When you go on to start knitting (in Dogwood specifically, but I guess anywhere) would you recommend transferring to DPNs or do you use a magic loop technique? I hate to give you conflicting advice but it’s really just a preference. I prefer double pointed needles for something small like that but Emily loves the magic loop. Both will work! Thank you for the tutorial. I love the pictures! I looked in several knitting books and nothing! Now I can start knitting the POP blanket! This cast on is essentially for crocheters and has been around for eons. It’s called the Magic loop. This is really a great cast-on for knitting in the round! I love it!